Steve and Erin with their four children, Hannah, Leah, Sarah, and Elijah. Steve Kozak has been named vice president of youth ministries at CE National. This correlates with CE National’s desire to expand and enrich their ministries to the young. Steve is no new-comer to youth ministries having served in Christian schools and various youth ministries. He has also written three books and, most recently, served as the director of the youth division of Awana International. Steve comes to CE National with recommendations from people who understand youth ministries well. Steve’s role is to expand the impact of Momentum Youth Conference, The National Institute, and ministry teams like Operation Barnabas summer ministry experience, and City Life summer ministry experience. Steve attended Moody Theological Seminary and graduated with a Master of Theology degree in 2010. He also earned a second masters degree in apologetics from Biola University. 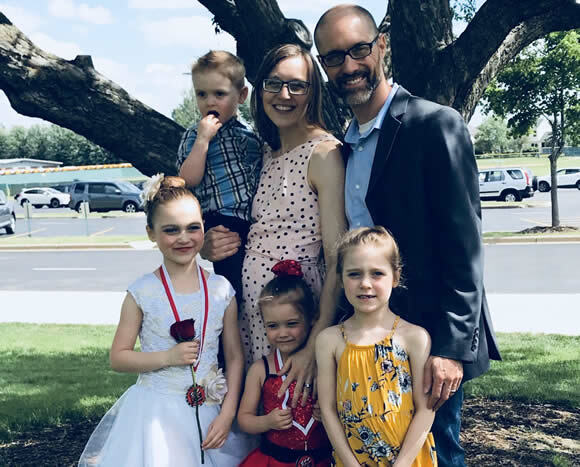 Steve and his wife, Erin, have four children who have enjoyed seeing God answer prayer for the next step in their dad’s ministry. “We are looking forward to the strengths and experiences that Steve Kozak will add to our team to impact this generation for Christ through Momentum Youth Conference. Welcome to the CE National family!” said Dave Rank, Momentum senior coordinator. “I am thankful for the addition of a new vice president of youth ministry to the CE National staff to help us move forward on many fronts in order to even better serve the next generation in the name of Jesus. Welcome aboard, Steve!” said Timothy Kurtaneck, director of church relations and youth leadership training Operation Barnabas, and The National Institute.